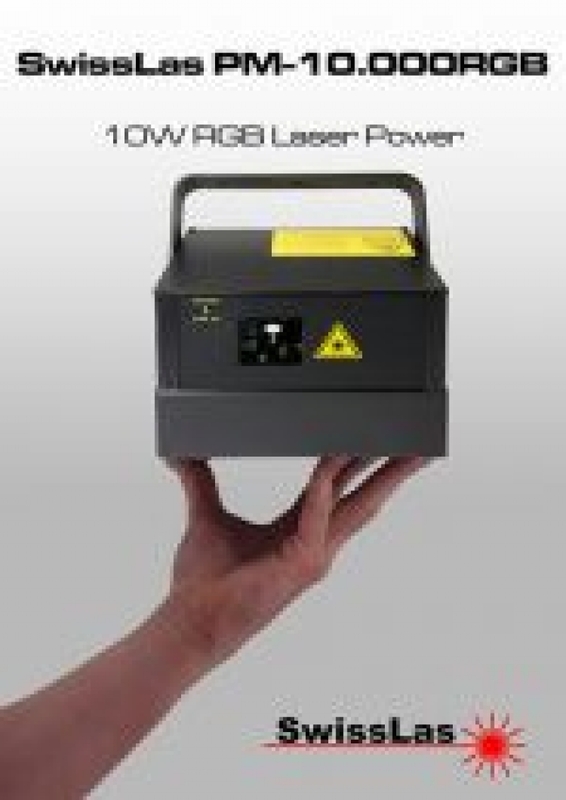 Laserworld presents the new SwissLas PM-10.000RGB laser – a 10W RGB laser show system in an enclosure, not much bigger than a hand. SwissLas was able to step up the power levels they could build into their compact Pure Micro housing from 5.7W over 8.2W and now to a spectacular 10W RGB white light power. This became possible due to recent developments in laser diode technology and a more compact way in which SwissLas combines the single sources inside the housing. 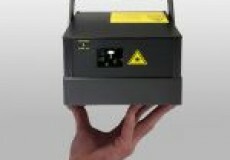 This new unit is designed as Pure a Diode laser show system, so only semiconductor laser sources are used. Color balance and scanning size can be adjusted with trim pots on the back panel of the laser. The PM-10.000RGB has a beam diameter of ca. 4mm and an average divergence of 1mrad. Due to the professional Pangolin ScannerMax 506 scanner system, it is fully graphics capable. Scanning speeds at >35kpps@8° ILDA. For even more performance an optional upgrade to CS-6210HP scanners is offered. With a size of only 7.3/6.5/5.0 in, the Pure Micro housing is extremely small. Nevertheless it is dust-proof built, and as there is no airflow inside the housing, the laser is nearly maintenance free.